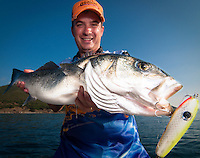 Portraits of fishermen holding a fish of the Moronidae family, known as Bass. 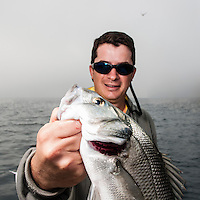 It can either be a European Sea Bass (Dicentrarchus labrax), Spotted Sea Bass (Dicentrarchus punctatus) or any other saltwater bass. 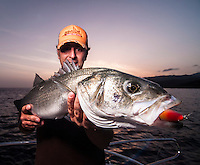 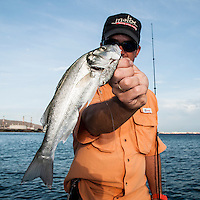 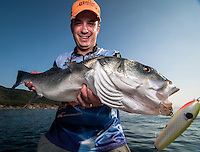 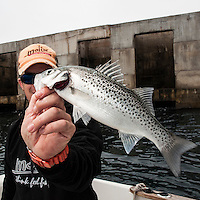 Inshore, reef, rocks, sand, beach, coastal, predator, food, tasty, prized catch, fine eating, shallow water, lure, lure fishing, casting, top water, mediterranean, north eastern atlantic.